When did you first get involved with Big Brothers Big Sisters? 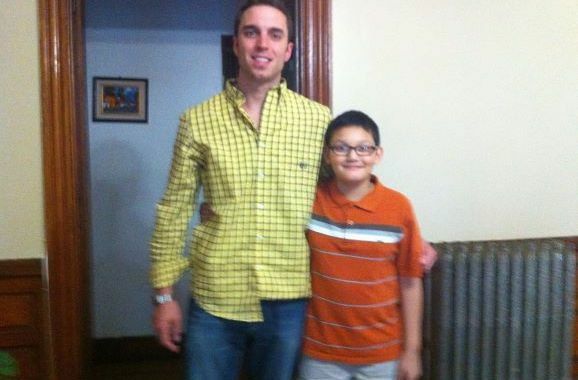 I was 26 years old when I first got involved with BBBS and started hanging out with Santiago. Describe the first time you met your Little. The first time that I met Santi, I drove from where I worked in Watertown to East Boston. As soon as I walked in, his mother, Luz, had a dinner prepared for me and we sat down together to eat a meal and I knew right then that I was already part of the family. Santiago was 11 years old at the time and came right up to me, wasn’t shy; I felt that he really wanted to get to know a new friend and I felt the very same way. I ended up staying at Santiago’s house for over 2 hours that first day and we made plans to hang out the following Sunday. Has being a Big taught you anything about yourself? About others? Being a Big has taught me that although at this point in life you have a core set of people, both family and friends that you have a relationship with, it doesn’t mean you can’t make new relationships that can last a lifetime. Even someone that is less than half of your age can teach you something. I am an only child and I don’t have a sibling, so being a Big Brother to Santiago has been like having a “real” little brother in my life. I’m just a “normal” person in the sense that I don’t feel that I have a wealth of wisdom to share with the world, but I can tell you that just by being involved in Santiago’s life, sharing my experiences, talking with him about the importance of school and continuing to push himself academically, has helped him him focus on certain things and avoid others. I’ve also learned that even though we don’t do many activities “officially” through the BBBS Organization, we still have been best pals for over 6 years and I know that we will be friends for life. Without the BBBS Program, I don’t know that I would have ever gotten the chance to hang out with Santiago and his family, so doing this has opened up a world of opportunities for me. And if getting out of the house 1-2 Sundays a month can bring so much fun and joy to me and others, then I feel in my heart that everyone should get out there and give back in one way or another. Do you have a favorite experience or memory with your Little? What have you learned about Santi’s culture? Santi and I both agree that we can’t name an individual favorite time or experience together. The first time we hung out was special because we were together for almost 8 hours playing every sport under the sun in the new park in East Boston near the airport – that set the tone for the next 6+ years that we’ve been hanging out. My favorite thing that we do is play basketball, specifically HORSE at that same park; it’s been ongoing for 5+ years. As far as Santi’s culture, he was born in America, but his parents are both Colombian, making him 100% Colombian. Luz, his mother, makes me Colombian food constantly and asks me about 15 times before I leave if I’ve gotten hungry if I don’t eat it. The World Cup and soccer in general is always on and should the Colombian national team or any Colombian soccer team be playing, it’s a huge deal for the entire family. Santiago went to Colombia 3 years ago to see some family that he had only spoken with on the phone and had never met in person, so that was extremely rewarding for him and talking to him while he was there was really neat because I could tell how special the trip to his parents’ home country was to him. Is there a specific memory you have when you realized you were making a difference? There are too many to count really, but being at his house and with his aunt having 2 little children, I was there to give a ride to Santi’s mom and aunt and drop off his uncle at the hospital while his aunt was giving birth to her second little baby boy. That to me makes me feel like I’m part of the family and that I’m helping. When it comes to Santiago himself, when he shoots me a text or calls me and asks when we’re hanging again, I KNOW I’ve made and continue to make a difference because I have this special guy reaching out to me asking when he can see me again. There’s not too many people in the world that ask that type of thing to a fellow man, so it always feels special to me and I know that I’ve made a difference. What advice would you give to other adults who may be hesitant to volunteer as a Big? I was concerned about the level of commitment when I started, but I can tell you that it is less of a time commitment than almost anything you do in your life! Can you manage to do something for a few hours a month? This is something you can do that is beyond rewarding in so many aspects! The ratio of what you get out compared to what you put in is exponential. I have a friend for life, I’ve been able to help Santi in so many ways, and even though he’s half my age, he has given so much back to me as well. You can NEVER know what you will get out of something unless you give it a try and I am so thankful that I gave being a Big a chance because it’s paid off big time! Describe the first time you met your Big. The first time I met my Big Brother was around 6 years ago. He came over to my house and we had a chance to get to know each other. The first time we hung out, we went to the park near the airport and we played some soccer and later went to eat. It was a very fun time and I enjoyed it a lot! What is your favorite memory with your Big Brother? Mike and I have both had very positive memories over the years. We’ve visited the Navy Yard, we’ve gone paint balling, we’ve played basketball and hiked during the summer. There are countless memories that we have had together and I don’t think it’s possible to pick just one. I’ve appreciated everything he has done for me and how included he has made me feel in everyday activities. Every time we hang out it is nothing short of fun and a good time, and I always look forward to when he comes over to visit or hang out. What have you taught Mike about your background and culture? Why is this important to you? Since my parents are both Colombian, and the people that we live with at home are Peruvian and Salvadorean, it is inevitable that Mike comes here and sees the impact our culture has on us, and I personally can see some growing on him. For example, he has asked me more about my Spanish heritage and has been more eager to learn some to speak Spanish to my parents. He asks about the food that we prepare, and has a grown taste for it. His interest can be credited to the Hispanic atmosphere around both my house and East Boston itself. It’s a place with a lot of Hispanic influence and I think Mike realizes that, which is why he shows a lot of care and attention towards my family. What impact has Mike had on your life? Mike has definitely taught me to always keep an open mind, focus on school and the importance of education, be aware of my surroundings, make good choices, and be eager to try out new things- even if I’m not used to them. A good example of this is when I first went hiking. I wasn’t used to the hiking experience and was hesitant on whether or not to actually do it. Mike told me to keep an open mind and to always try new things. This made the experience much more enjoyable. After that moment, it really changed my view on things that seemed foreign to me and it definitely kept my comfort level open. He gives me great life advice and I never take it for granted.